Sorry we are Full for this Trip. We will be chasing the northern lights in February. Depart from the Russian border town of Kirkeness Norway on the Hurtigruten for a 1.5 day cruise to Tromso Norway watching for northern lights en route on the comfort of our cruise ship. We arrive late in Tromso and disembark the ship for our hotel. Overnight in Tromso and spend the next day touring the city. There are a number of sightseeing tours possible. Depart Tromso by air Sunday. Hurtigruten is one of the world’s great classic voyages, which most people choose to take in the summer. But the Hurtigruten ships sail all year round, and in winter they offer one of the most pleasant – and reliable – ways of seeing the Northern Lights. A trip by Hurtigruten is also a great way to travel between wonderful winter destinations in Northern Norway, and delivers its promise of stunning panoramic views of the winter landscape. 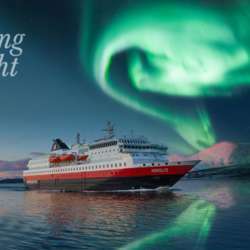 The routes plied by the Hurtigruten vessels follow the planet’s auroral oval, with the ships generally sailing well away from coastal towns and communities where there is light pollution. In Nordland and Troms, where settlements are quite scattered, porch lights and the lights from sitting room windows twinkle softly in the distance like a palely gleaming row of pearls along the water’s edge; while along the coast of Finnmark much of the voyage is in complete darkness. In other words, in this part of the world the light conditions for viewing the Northern Lights are the best possible. Number of tour options Sunday in Tromso. Depart by air Sunday afternoon back to Oslo late afternoon/evening. from Tromso to Oslo Protected content Protected content on exact flight time. Prises subject to change until we book. Need to confirm this trip with payment. Cruise and hotel Protected content 270 Euros. Email me for details for transfer and further info. Thanks...Sorry we are full for this trip.